With its illustrious maritime history, picturesque coastlines and quaint islands and towns, New England is a summer hot spot for luxury charter vacations, and from June 18-21, the Newport Charter Yacht Show presented by Helly Hansen Newport will showcase the impressive lineup of world-class yachts available for charter in the region this season. Staged at the mega-yacht friendly Newport Shipyard in Newport, R.I., the annual event is the only one of its kind in the U.S., allowing brokers and industry professionals to tour each yacht’s accommodations and get to know the captain and crew. Of the 24 charter yachts currently registered for the show, 18 are new to the event and 13 are measuring in at 100 feet and longer. The 109-foot Marae is represented by Karen Kelly Shea and her team at Nicholson Yachts. 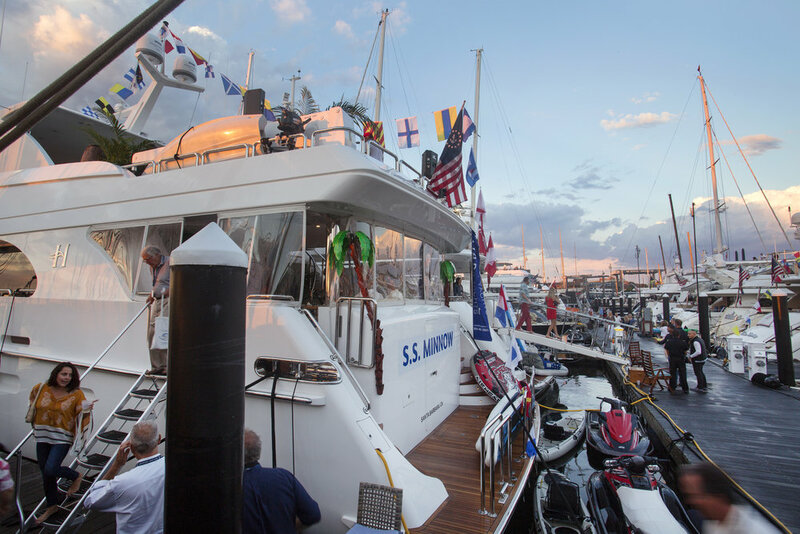 Attendees will participate in a 'yacht hop' on the Wednesday evening of the Charter Show. Click here for full list of boats registered. Bank Rhode Island and will sponsor a daily breakfast under the main show tent catered by Newport Shipyard’s popular eatery Belle's Café. Special events start with a captain and crew’s briefing and happy-hour social on Monday sponsored by Sea Hawk Paints and Alexseal Yacht Coatings. Drinks for the briefing are sponsored by Bridge Liquors. On Tuesday evening, after the show closes for the day, a captains’ competition will take place that will feature flying a drone, inflating a fender, and creating a small floral arrangement. Wednesday evening is reserved for the much-anticipated Yacht Hop, while an industry-led educational seminar hosted by American Yacht Charter Association will take place on Thursday morning, and the ever-popular crew competitions sponsored by ISS GMT, Denison Yacht Sales, and Sentinel Limousine (for Best Charter Yacht Chef, Tablescaping, Signature Cocktail and Designer Water) will take place onboard the yachts Tuesday and Wednesday. Thursday evening’s party and awards dinner, sponsored by Ward’s Marine Electric and KVH Industries, tops off the social events before the show’s final day on Friday.